The ice in the Arctic Sea is showing the second lowest extent on record. – Weathernews Inc. The ice in the Arctic Sea is showing the second lowest extent on record. The Global Ice Center at Weathernews, Inc. has announced that the Arctic region has experienced a steep decline in the sea ice extent in the summer of 2010. The current sea ice continues to show the second lowest extent, following the lowest recorded in summer 2007. The current low level of the ice extent is attributed to a couple of factors. A continuous decrease of sea ice thickness seen in recent years has affected the mobility of the sea ice, contributing to sea ice outflow from the Arctic area. In addition, a dominant high pressure system over the area is believed to accelerate the outflow during early summer. In particular, the western Arctic area has shown a remarkable decrease of sea ice coverage. If the sea ice recession continues to persist across the area, the Northwest Passage will possibly be open sometime in late August. Weathernews Inc. has started to issue the GIC Weekly Report. This weekly report is published via our official website on Thursday of every week. The Global Ice Center continues to monitor the ever-changing sea ice conditions in the Arctic Ocean with the prospect of the opening of the Northwest and Northeast Passages. The sea ice extent in the Arctic Ocean has shown a steep decline this summer, as seen in recent years. Under the dominant influence of a high pressure system over the Beaufort Sea in May and June, the outflow of the Arctic sea ice through the Greenland Ocean appeared to be accelerated during the period, leading to the lowest June sea ice extent in recorded history. Although the rapid decrease has slightly subsided since July, the Arctic sea ice extent at present is roughly 6 million square kilometers, approximately 6% less than the average of the past seven years. This is the second lowest extent ever for this time of year, after the lowest observed extent in summer 2007. The Arctic sea ice coverage is forecast to show a continuous decrease, approaching the minimum extent in late August or early September. A recent study on sea ice flux over the Arctic region based on satellite imagery indicates that the sea ice tended to flow into the eastern Arctic and, in contrast, the sea ice across the western Arctic scattered during the last winter and spring. This suggests the presence of less ice volume than average across the western area, while somewhat thicker ice distributed in the eastern part in the current condition. As the melting of sea ice will proceed through August, there is a growing possibility of opening the Northwest Passage in this season. As for the Northeast Passage, the sea ice melting in the western Laptev Sea will be a key for the opening in this summer. In 2009, the sea ice extent in the Arctic recorded the third lowest extent following the lowest in 2007 and the second lowest in 2008. Despite its relatively high average temperature as a whole, and slightly lower sea ice extent compared to those in the past several years, neither the Northwest or Northeast Passages opened throughout the season. This is likely attributed to a relatively slow sea ice melt in late July and early August, and less strong wind which was supposed to promote the ice outflow from the Arctic towards the Atlantic Ocean. As a result, the sea ice remained off-shore of the Taymyr Peninsula in the East, and across coastal areas in the Canadian Arctic Archipelago. 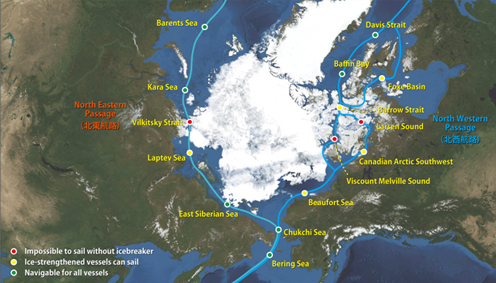 In early September, with icebreaker assistance, several freight vessels from a German shipping company sailed through the half-open Northeast Passage. Now there is a rapidly growing interest in the realization of the polar routes in near future. The Weekly Report for the Arctic Region will be published through the official WNI Global Ice Center website every Thursday. On this site, a variety of information, including graphical data for the latest sea ice coverage and concentration are available. From a general outlook on ice conditions to ice extent predictions using our proprietary models, the report is for a wide range of specialists and generalists. Informs latest ice conditions, and weekly images. Displays graphs including the last few years of data on ice extent. The graphs feature various data on both the Northeast and Northwest Passages, along with changes and comparisons of the minimum and maximum ice extent each year. Various specialized ice conditions on both the Northwest and Northeast Passages are clearly displayed. Because the information is highly detailed, captains making coastal voyages through the Arctic can use it to help make informed sailing decisions to help ensure safe and timely passage. Using Weathernews' in-house I-SEE Model, forecast changes in ice coverage for out to two-weeks in the future are shown. In order to support safe shipping operations, the Global Ice Center provides a variety of information based on real-time monitoring and prediction of global ice conditions. Since this May, WNI has placed a new operation center in the "SHIRASE" (a retired Japanese Antarctic observation ship), which was reborn as a symbolic place of the company's environment-related activities, and now at berth in Chiba, Japan.